Marie Osmond is excited to present Adora Belle - Ramona Royal from her articulated Mop Top collection. Costumed in a turquoise blue & creamy white striped drop waist dress, black tulle underskirt, striped leggings, arm gauntlets, and sparkly trinket adornments throughout; this cutie is a regally royal Mop Top. 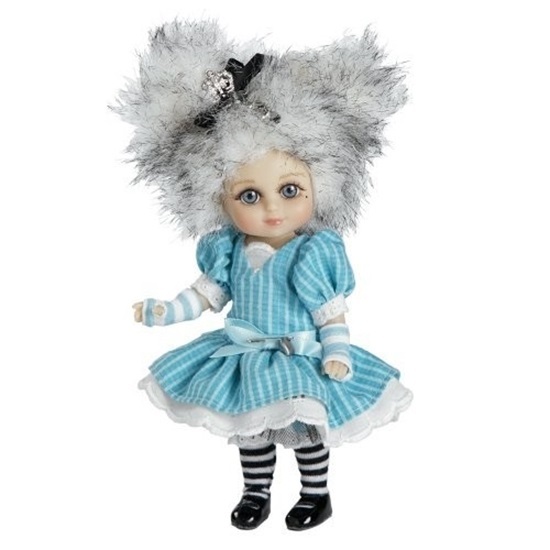 Sculpted by Marie Osmond, Adora Belle - Ramona Royal has been handcrafted with the special attention to detail that is the hallmark of all Marie Osmond dolls. Adora Belle - Ramona Royal is hallmarked with Marie’s signature and is hand-numbered. She is 13 inches standing and an edition of 1000.